Superbly situated in the Bow Valley of the Canadian Rockies right in the alpine village of Canmore, Grande Rockies Resort is ideal for families, golf and ski enthusiasts. Visit our indoor pool and take a ride on the waterslide, spend some family time in the kids pool and then relax in our indoor-outdoor hot tub. Stay active in the fitness centre, or on the nearby running and hiking trails. Grande Rockies Resort is the perfect home base to explore Canmore's many recreational opportunities. Please note our check-in and check-out times and addition hotel policies. This building features economical standard hotel rooms and includes access to all of the amenities in our main building. This building features our spacious suites and grande penthouses, restaurant, waterpark, hot tub, and gym. Traditional hotel guest room accommodation located in our separate annex building, adjacent to the main resort building. Each room has 250 square feet of space and includes two double beds, desk, mini-fridge, microwave, alarm clock, iron & ironing board, included Wi-Fi access, 40" flat screen TV, telephone, marble bathroom, rainfall shower, arm chair and ottoman. Should you require the use of kitchen facilities, please book one of our Suites, as these traditional hotel rooms do not include kitchen amenities. Traditional hotel guest room accommodation located in our separate annex building, adjacent to the main resort building. Each room has 250 square feet of space and includes a king bed, desk, mini-fridge, microwave, alarm clock, iron & ironing board, included Wi-Fi access, 40" flat screen TV, telephone, marble bathroom, rainfall shower, arm chair and ottoman. Should you require the use of kitchen facilities, please book one of our Suites, as these traditional hotel rooms do not include kitchen amenities. Our one bedroom suites offer a minimum of 570 sq. feet of space and are located in the main resort building. Suites include a full kitchen with dishwasher, one king size bed, double pull out sofa bed, one full bathroom with stand up shower, in-suite laundry, desk, iPod alarm clock, iron & ironing board, free WiFi access, two flat screen TVs, a gas fireplace, patio/balcony and barbecue. Our two bedroom suites offer a minimum of 760 sq. feet of space and are located in the main resort building. Suites include a full kitchen with dishwasher, one king size and one queen size bed, double pull out sofa bed, two full bathrooms, in-suite laundry, desk, iPod alarm clock, iron & ironing board, free WiFi, two flat screen TVs, a gas fireplace, patio/balcony and barbecue. Our two-storey Grande Penthouses are on the top floor of our main resort building. The elegantly-designed suites consist of two bedrooms (1 with a king size bed, and one with a split king or queen), washer and dryer, and natural gas barbecue. Some units also have a double pull-out sofa bed. 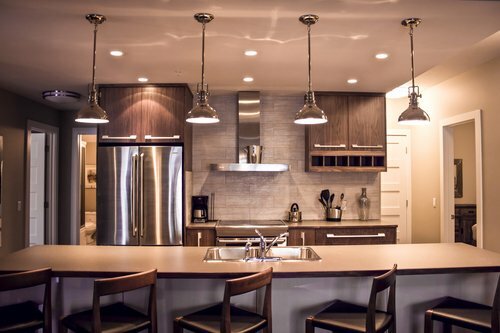 Units feature large open-concept living spaces including a gourmet kitchen, living room, and dining area, balcony and mountain views. A minimum two-night length of stay is required for Grande Penthouses.